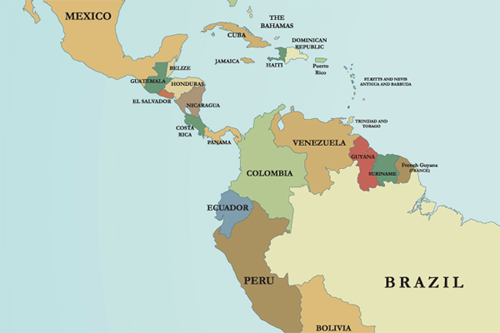 Venezuela may soon become the world's first nation in 2015 to see its government and economy implode. The South American country, led by Hugo Chavez for 15 years from 1998 to 2013 (with all the controversy the man brought on the world stage) is heavily dependent on its oil industry and the revenues it brings. Those revenues also allowed Chavez to champion socialism in his nation, and create economic alliances with other socialist-leaning or communist nations in the Western Hemisphere, though Teatree believes it fair to say, that simple anti-US and anti-capitalist perspectives provided most of the heat for these groupings. Unfortunately, today, Venezuela is teetering as oil revenues have plunged in the past six months, corruption remains rampant, and its leader (handpicked by Chavez and propped up in power by the few benefiting from the power-structure status quo), unable to articulate a pragmatic path forward. President Maduro, to be fair, is in over his head, and chained to the ideology and memory of Hugo Chavez. As wikipedia notes, "A former bus driver, Maduro rose to become a trade union leader, before being elected to the National Assembly in 2000. He was appointed to a number of positions within the Venezuelan Government under Chávez, ultimately being made Foreign Minister in 2006. He was described during this time as the "most capable administrator and politician of Chávez's inner circle"." Maduro was Venezuela's Minister of Foreign Affairs from 2006 to 2013 and Vice President of Venezuela from 2012 to 2013. With his main asset being supportive of Hugo Chavez who in turn was able to talk big because oil prices were high and revenue flowing in, it was a very narrow base upon which to lead the nation on Maduro's own (about 95 percent of the money Venezuela earns from exports comes from its oil sales, according to an AP article on January 16). In the past six months, however, since oil prices have plunged, Maduro is confronting an increasingly dire range of options. For most of January, Maduro has gone on a world circling trip visiting nations that might lend him substantial funds to cover the lost oil revenues. He has visited Russia to meet with President Putin. In China, he secured a $20 billion infusion of Chinese investments, and in Qatar, he announced a new financial alliance. Maduro also stopped in Iran, Saudi Arabia and Algeria, but with not a great deal to show for it. Returning home, Maduro received the equivalent of a ticker-tape parade organized by his supporters, even though while traveling, his government had to implement a new rationing system to curb out-of-control lines at stores. In addition, young protesters began blockading streets and opposition leaders were loudly calling for immediate change. 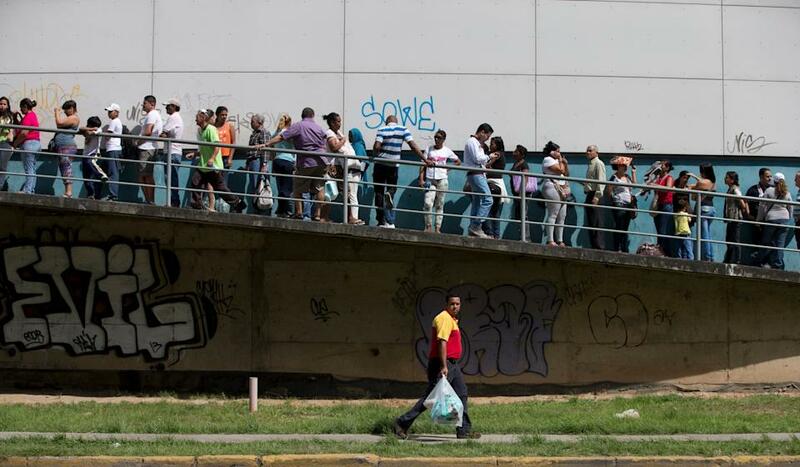 Another AP article reports, "Venezuela is seeing lines unheard of even in this shortage-plagued nation, with people lining up overnight to buy necessities like soap, milk and diapers. The state has deployed military guards to maintain order as stocks run low after long winter holidays. 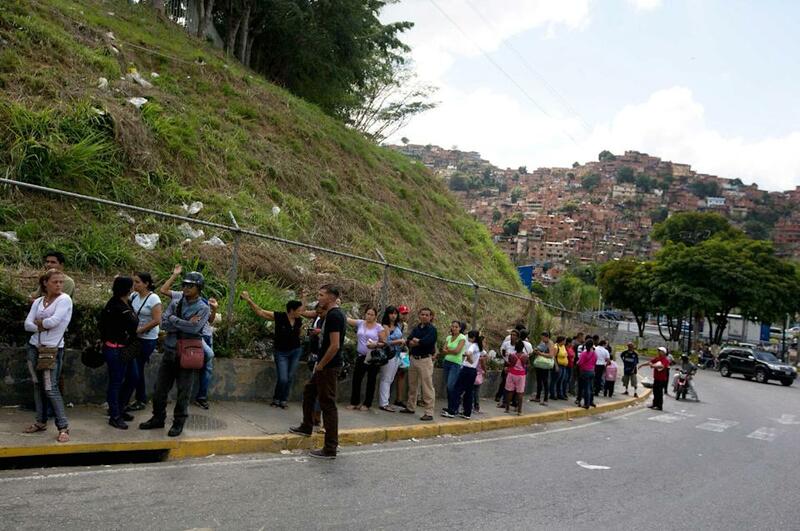 Food Security Czar Carlos Osorio drew jeers last week when he said that the existence of long lines proved that Venezuela has plenty of food. Otherwise, he said, there would be nothing to line up for." Beyond the immediate scarcities and unrest, there are those pesky loans already taken out by Venezuela, and payments are coming due. Default on a variety of financial instruments looms. And where it all ends, in this nation with enormous potential wealth, no one knows. But let's end on a positive note - leaving behind the long lines that give testimony to scarcity and corruption in urban Venezuela, a couple pictures of the country's southern and western regions. 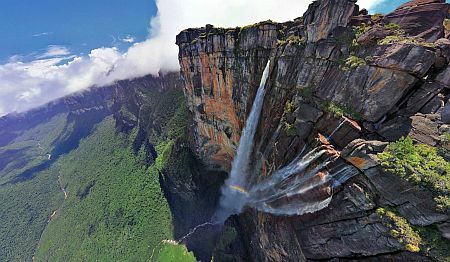 The website www.climatestotravel.com observes, "in the state of Bolìvar, we find the huge Canaima National Park, which is generally more humid and has greener landscapes; here we find incredible waterfalls like Salto Angel, 3,212 feet (979 meters) high, and Salto Kukenan, 2,211 feet (674 meters) high."